I’ve had a 3 pound kohlrabi rolling around in my refrigerator for over a week now. I brought it home after a recent work day at the GrassRoots Garden, trimmed off its gangly cabbage-like leaves, crammed it into a rear corner of the fridge, and proceeded to ignore it. 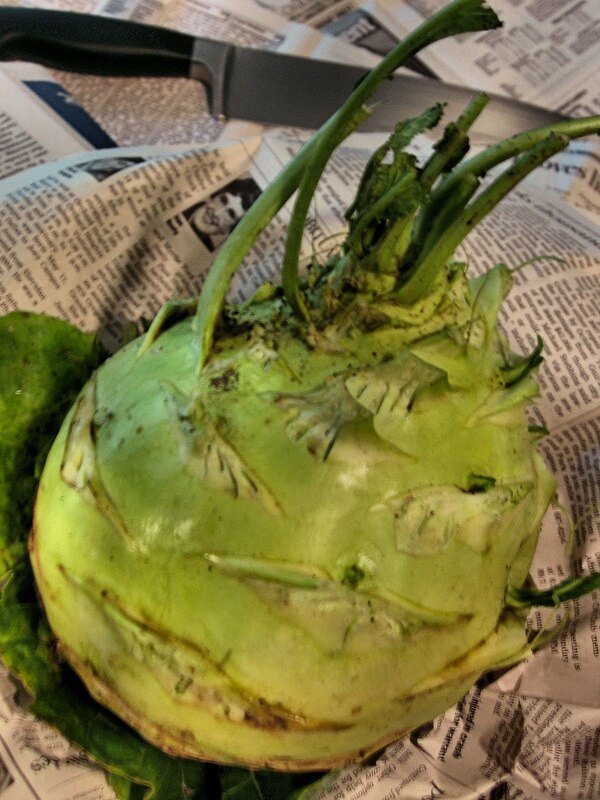 Actually, I’d been procrastinating because other than nibbling on it raw, I hadn’t the slightest idea what to do with a massive 3 pound kohlrabi. Lamenting my uncertainty to fellow gardener, Claire, she raved and recommended a curry treatment. Huh. After a little research, I learn that kohlrabi is low in calories, about 19 per ½ cup; it’s high in fiber, potassium, calcium, vitamin A and C. It has a mild cabbage-like flavor and a moist, crisp texture. I’m told to look for 2” bulbs; if larger, peel them. Right. 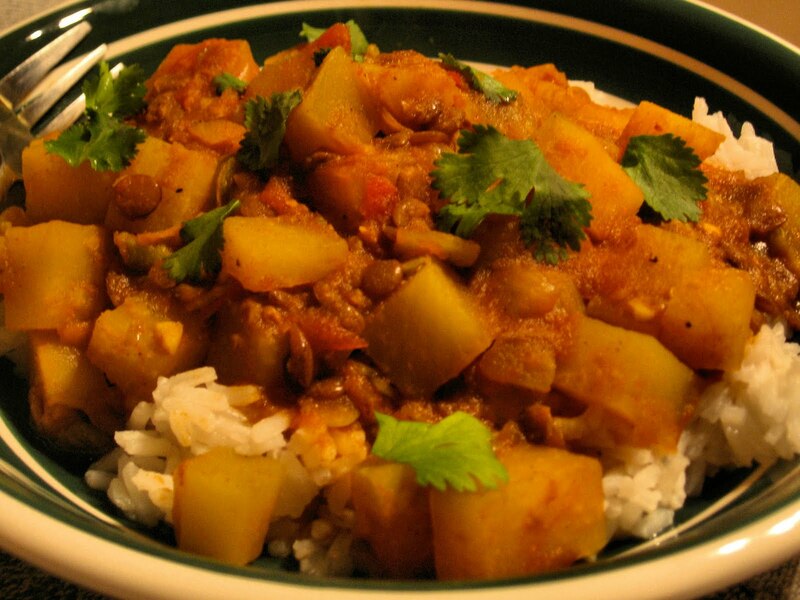 The kohlrabi is very popular in Northern India, and has made its way to Israel, China and Africa. It is also used in Italian, French and German cuisines. This evening I decide it’s time to confront the behemoth taking up way too much refrigerator space. I hack away–peeling and whacking it into bite size morsels. I have a small bag of lentils which I pre-cook while wrestling with the rock-hard rascal. The remainder of the dish comes together quickly and by the time my jasmine rice is cooked the kohlrabi is tender (20 minutes). I suspect my 8” specimen takes a little longer than the average 2” bulb. I’m not sure my rendition is authentically Indian, but it sure is good. Heat oil in heavy pan. Stir in turmeric, coriander, cumin, chilies, and onion. Sauté on medium heat until onion browns about 8 minutes. Add chopped tomatoes, pepper, tomato paste and sauté another 5 minutes. Add kohlrabi, lentils, and stock. Cover and cook until kohlrabi becomes tender—about 9 minutes. If using kohlrabi greens add in the final 5 minutes of cooking. Garnish with cilantro. Serves 8.